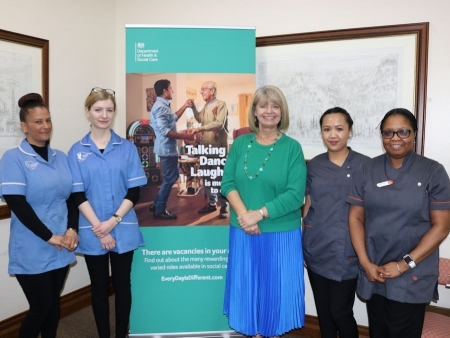 West Worcestershire MP Harriett Baldwin joined MPs across the UK supporting a national recruitment campaign to fill 110,000 adult social care vacancies. The national campaign, which starts today (February 12) aims to encourage more people to consider a career as a care worker and people who work in the sector were invited to meet with MPs at a launch event in Westminster. Harriett offered her support to the campaign which will focus on promoting a website – www.everydayisdifferent.com – across local and national media and digital media platforms. According to latest research about 1.4 million people work in adult social care and there are 110,000 vacancies in England with around 14,500 vacancies across Worcestershire. Harriett commented: “Last year, I joined carers in Worcestershire to mark the 70th anniversary of social care in the county and it was really inspirational to meet with the dedicated people, some of whom, have worked all their lives carrying out this important role. Photo: Harriett Baldwin MP meets with adult social care workers at an event at the House of Commons.